Cadillac, a U.S. marque since 1902, built some of its best cars during the post-WWII boom, and from 1949-1962, advertised them as prestigious luxuries. General Motors, with Chief stylist Harley J. Earl leading the charge, brought out innovations now called classic: tailfins, lots of chrome and polished stainless steel, and wraparound windshields. Bankers who'd already proven themselves, businessmen trying to make it, Jewish and black workers hoping to achieve the American dream but blocked from attaining it — all were anxious to have an impressive car that was also dependable and a sound investment in their futures. GM's Cadillac was happy to oblige. It was aided in that by its long-time advertising firm MacManus, John and Adams. Founder Theodore F. MacManus had been a newspaper reporter who migrated to working with advertising firm Erwin, Wasey & Co. before opening his own agency in September 1916. His firm specialized largely in automotive advertising, with Cadillac, Dodge and Hupmobile among its clients. 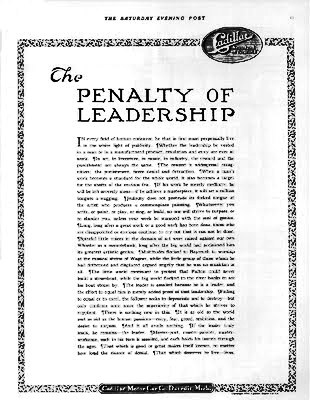 MacManus wrote a famous Cadillac all-text ad that ran just once — in the January 2, 1915 edition of The Saturday Evening Post — entitled "The Penalty of Leadership." Cadillac Penalty of Leadership Ad. "In every field of human endeavour, he that is first must perpetually live in the white light of publicity. Whether the leadership be vested in a man or in a manufactured product, emulation and envy are ever at work. In art, in literature, in music, in industry, the reward and the punishment are always the same. The reward is widespread recognition; the punishment, fierce denial and detraction. When a man's work becomes a standard for the whole world, it also becomes a target for the shafts of the envious few. If his work be mediocre, he will be left severely alone — if he achieves a masterpiece, it will set a million tongues a-wagging. Jealousy does not protrude its forked tongue at the artist who produces a commonplace painting. Whatsoever you write, or paint, or play, or sing, or build, no one will strive to surpass or to slander you unless your work be stamped with the seal of genius. Long, long after a great work or a good work has been done, those who are disappointed or envious, continue to cry out that it cannot be done. Spiteful little voices in the domain of art were raised against our own Whistler as a mountebank, long after the big would had acclaimed him its greatest artistic genius. Multitudes flocked to Bayreuth to worship at the musical shrine of Wagner, while the little group of those whom he had dethroned and displaced argued angrily that he was no musician at all. The little world continued to protest that Fulton could never build a steamboat, while the big world flocked to the river banks to see his boat steam by. The leader is assailed because he is a leader, and the effort to equal him is merely added proof of that leadership. Failing to equal or to excel, the follower seeks to depreciate and to destroy — but only confirms once more the superiority of that which he strives to supplant. There is nothing new in this. It is as old as the world and as old as human passions — envy, fear, greed, ambition, and the desire to surpass. And it all avails nothing. If the leader truly leads, he remains — the leader. Master-poet, master-painter, master-workman, each in his turn is assailed, and each holds his laurels through the ages. That which is good or great makes itself known, no matter how loud the clamor of denial. That which deserves to live — lives." Cadillac had brought out a V8 Touring car but did so before all the bugs were worked out. Packard mounted an attack with rumors that the car was unreliable. MacManus's ad, entitled "The Penalty of Leadership," mentioned Cadillac only in the border surrounding the text and explained that envy in others was occasioned only by companies honoring "standards of excellence". 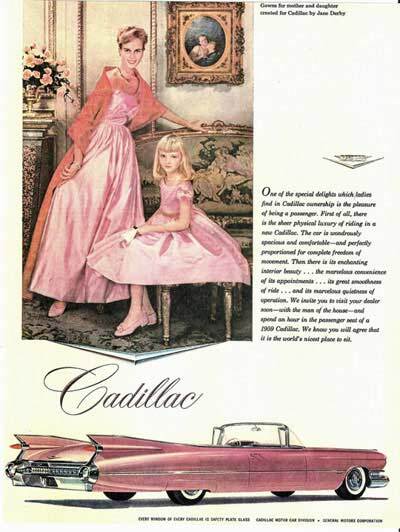 Almost immediately Cadillac was besieged with customer requests for copies of the ad, and sales boomed. Some years afterwards MacManus was joined by W. A. P. John and James R. Adams who had worked on the Cadillac account at Campbell-Ewald and continued to advertise Cadillacs. The firm didn't always get things right, however. On March 29, 1956, Ernest Jones, then President of the firm, spoke to the Pittsburgh Advertising Club, saying that TV advertising might be OK for low-cost goods but that a 60-second commercial couldn't deliver the sort of consumer interested in purchasing high-priced durable products. Tell that to firms now advertising Lexus, Mercedes, or Jaguar. And speaking of Jaguar, it might be of passing interest to some that this season's (2012) Episode 12 of "Mad Men" mentioned MacManus as one of the firms competing with Sterling Cooper for the Jaguar account. Side Bar: text of that ad: You can also link to an original of the ad in favorites. In the fifties, it was Jim Adams who handled the Cadillac account for MacManus and who consciously advertised the car to those on their way up. Purportedly, he said he wasn't selling a mechanism but rather a state of mind. As one 1953 ad had it, Cadillac was the "first love" of 20 million motorists "who would rather own a Cadillac than any other make car built in the land." Their love for the car was easily explained since the car was "supremely beautiful", with interiors "gracious and luxurious almost beyond description." Cadillac was confident that "one look and one ride" were all it would take to have customers agree that this was "the perfect year for making [their] motor car dreams come true!" Praise for Cadillac built continuously, even outside the automotive community. 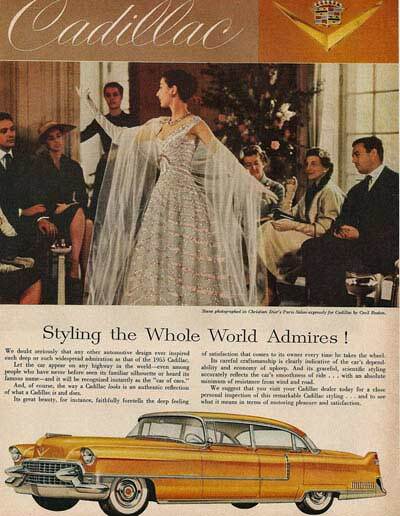 Also in 1953, for instance, an ad for fine furs also highlighted a valued Cadillac. Northwood Fur Farms featured a woman and her daughter in knee-length fur coats, alongside a green Cadillac. A collaborative ad showing five products in 1955 heralded this slogan: "Recognized as the height of quality throughout the world". The five products, seemingly unrelated, were Cadillac, Ceil Chapman (a Marilyn Monroe favorite) gowns, Schumacher wallpapers, Trifari costume jewelry, and Du Mont televisions. A 1961 ad announced how far Cadillac had come in convincing discerning customers of its intrinsic value: "The highest praise that can be accorded any product in any field is to declare it the Cadillac of its kind." The ad featured a black Cadillac Fleetwood 60 Special on a blue silk brocade background with diamond and sapphire jewels by Cartier filling the Cadillac crest and the "V" representing the shape of the engine. 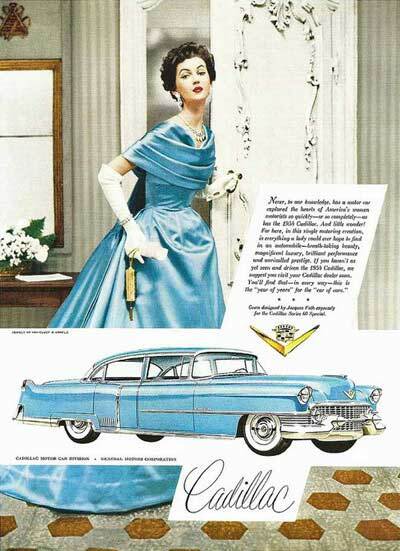 Another ad that same year showed a blue Sixty-Two Coupe against a light blue brocade background with a jeweled Cadillac crest and "V" in turquoise and diamonds (this time by Van Cleef and Arpels), along with long, yellow satin dresses for mother and daughter, an ensemble designed by Ines di Santo Roma, a designer well-known for her bridal creations. The ads continued year after year until 1963 when advertisements, while still featuring classic symbols of achievement such as columned houses; circular brick driveways; landscaped lawns; etc., began to appear more generic in nature. There were no longer tag lines identifying the designer, the jeweler, or the specific locale. Following World War II, America was the richest country in the world. After years of pent-up demand, there was an explosion in the production of consumer goods and in an advertising industry to sell them. Credit was available as never before, and soldiers returning from war were determined to live large and give their families everything they could. 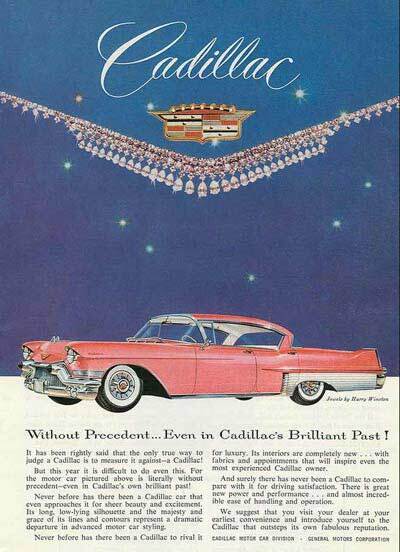 1949 was a banner year for Cadillac. They continued with the '48 nascent tailfins; introduced a new overhead valve V-8 engine; and produced the millionth Cadillac ever built — a 1949 Coupe deVille, the new two-door "hardtop convertible" that lacked a B pillar and was called "a symphony in motion." In print ads, Cartier jewels — a double strand of pearls on a dark blue background; yellow diamonds and sapphires; rubies, diamonds, and gold; etc. formed the Cadillac crest and "V". The cars themselves were accompanied by blocked text, extolling the car's features: [It was] "only natural that the driver who sits behind the wheel of the new 1949 Cadillac should be instantly impressed with the richness of his surroundings — for Cadillac, traditionally, builds a luxurious motor car." Another ad intoned, "If you want America's most distinguished automobile, your choice of a Cadillac will be inevitable." 1949 Cadillac Coupe deVille Ad introduced the new "hardtop convertible. Cadillacs, for the 1950 model year, underwent a complete restyling and looked heavier but also lower and sleeker. Tailfins were a little more pronounced, the windshield was one piece, and there were rear fender skirts. In one distinctive ad, a silver striped mink coat was shown on a raven-haired beauty who loomed over a Cherry red four-door sedan that was called "the most beautiful and distinctive creation ever to bear this honored name." Jewels for the ad campaign became more flamboyant. A Cartier multi-layered citrine flower hung from a gold chain, and the ad reminded us that "Cadillac [was] the great common meeting place for the world's most distinguished people. . . . Its owners [were] too numerous, too varied and too intelligent to have been won and held by anything save quality alone." Van Cleef and Arpels jewels — a diamond chain with a ruby and diamond orchid pendant set off by three platinum leaves — appeared in one ad with a light green, 4-door 61 Sedan, and again (a necklace with vivid ruby ribbon edged in diamonds setting off a starburst of rubies and diamonds) with a red, 4-door sedan claiming that the new 1950 Cadillac cars were "simply out of this world." Cadillac sold more than 100,000 cars that year, an all-time high. They apologized to customers who couldn't get the Cadillac they had their hearts set on. 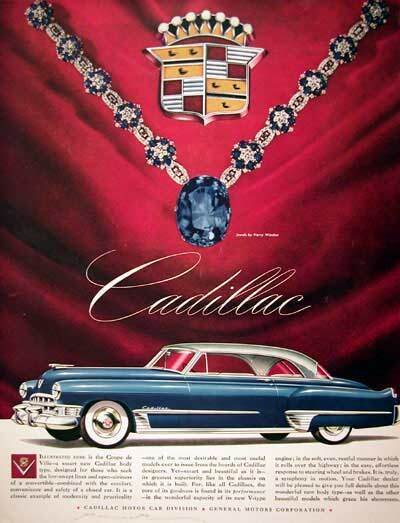 In an ad bedecked by Harry Winston jewels (a dramatic thick ruby and clear quartz necklace set off by a green-striped fabric), Cadillac regretted "that all who expressed their desire to own a Cadillac cannot do so. But we believe. . . that a great many may have needlessly denied themselves the pleasure." Those buyers willing to wait just a little longer for their order, it seemed, could still own a car of luxury. There were only minor styling changes to the 1951 Cadillac but they were notable: large, bullet-shaped bumper guards, later known throughout the industry as Dagmars (for a well-known tv personality with prominent cleavage) and ice cube tray grilles beneath the headlights. Even though Cadillac was still producing more than 100,000 cars a year, customers were once again admonished to be patient to take delivery of their Cadillacs. One ad with a Van Cleef and Arpels jade and diamond necklace above a four-door green sedan entitled "Don't Be Swerved from your Purpose!" suggests, "If you are offered quicker delivery with another car — ask yourself why." Furs (by Meyer Brothers, Revillon Feres, and others) were back in a big way, too — striped caramel mink, white mink, sable, black chinchilla with white fox trim, leopard skin, etc. — and this time the ads were directed specifically at women. "One of a woman's most notable characteristics is her ability to know what she wants," intoned one ad, while another chirped, "Everything about a Cadillac is far, far nicer this year — for the ladies" who were sure to enjoy greater comfort, beautiful interiors, handling ease, and a "new beauty of line and contour." 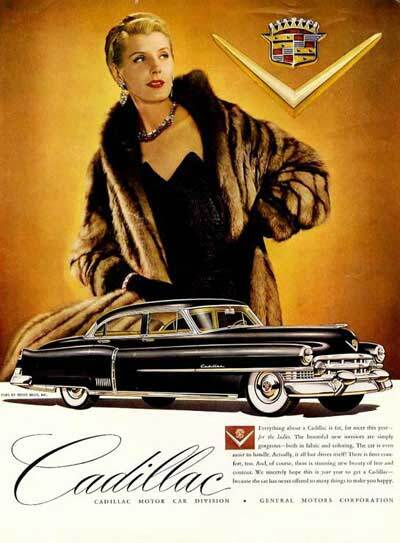 Furs were often featured in the 1950 Cadillac Ads. Jewels continued in abundance, as well, with Van Cleef and Arpels showing a gold and emerald necklace on a red, cross-hatched background above a medium green four-door Cadillac sedan, along with text noting the Cadillac's reputation for long life, making it an excellent investment. Another Van Cleef and Arpels offering was a red jasper and diamond necklace on a blue background above a red, four-door sedan, touting as well the Cadillac's fuel economy, performance, dependability, and long life. A Harry Winston jade necklace was reflected in a highly polished silver "V", both above a yellow two-door hardtop, with the affirmation that a Cadillac provided "the greatest happiness a motorist can know." Surrounded by "new and exciting beauty," the motorist was left with a profound sense of pride since he was "now master of one of the world's most perfect mechanisms." There seemed to be no end to the advertising hyperbole applied to the best-selling Cadillacs. 1952 marked Cadillac's 50th year. To celebrate, GM produced new "Golden Anniversary" models. Engineering improvements, rather than stylistic changes (other than the emblems cast in gold), marked the anniversary cars. Among those improvements were a four-barrel carburetor; a new Hydra-matic transmission; optional Saginaw power steering; a new free-flowing intake manifold; larger exhaust valves; a twelve-volt electrical system; and dual exhaust manifolds. The cars were still massive with rounded body lines and were advertised as a "Cadillac Among Cadillacs" and a "Who's Who of the Highway." A golden world globe was featured in one ad that crowed, "Inside and outside — it's the world's new standard for distinction." Van Cleef and Arpels jewelry returned to Cadillac ads — with a gold cord necklace wrapped in diamonds and ending in a central gold and diamond tassel , as part of a mountain snow scene featuring a red, two-door hardtop. Another Van Cleef and Arpels ad displayed a sapphire and diamond necklace, with polo gear in the foreground beside a two-toned hardtop — yellow with black top. And Harry Winston was in evidence, as well, with a stunning diamond and sapphire necklace advertising a blue, four-door sedan, another Golden Anniversary creation. New to the jewel ad campaign was Laykin et Cie at I. Magnin, with a refined ruby and diamond necklace above a green, two-door convertible, with this tag line: "A single mile behind the wheel will convince you it's a wonderful year to make the move!" 1952 Cadillac Van Cleef "Polo" ad. While the following year marked the beginning of Cadillac's "second half-century of progress" in the automotive world, there were only minor changes to the car. Nevertheless, the changes were noticeable — air conditioning, thicker bumpers, a redesigned front grille, and even larger Dagmars on the front and smaller ones on the rear bumpers. And Cadillac introduced its incredibly popular Eldorado with a number of firsts in the industry — wraparound windshield, automatic headlight dimmer, and signal-seeking car radio. Cadillac remained clearly America's luxury car sales leader. Ads called the '53 cars "more elegant than words"; "unbelievably beautiful"; cars with "unprecedented luxury and comfort"; etc. Customers had many reasons to move up to Cadillac: "beautiful styling," "magnificent performance," "marvelous luxury," and that all-important "great prestige." Cars were available in pastel tones — light blue, yellow, aqua, etc. as well as the more-familiar darker jewel tones. Cadillac further claimed that surveys (of unknown origin) showed that more than twenty million American motorists would rather own a Cadillac than any other American car. Fabulous jewels still appeared in the ads — exquisite white and yellow diamonds, magnificent sapphires, sparkling emeralds, and more. One of the more unusual '53 pieces was a pin designed by Harry Winston, a flower with five petals outlined in double rows of gold — with diamonds interspersed among the petals. 1953 Harry Winston Cadillac ad. 1954 brought a significant redesign to Cadillac. The cars were longer, lower and wider. They had a flashy, multi-celled front grille set off by inverted "gull wing" bumpers on either side; headlights mounted higher; power steering; and windshield washers. Advertised as "the ultimate in motor cars," "as thrilling to drive as to see," and "styled to be copied for years to come," the 1955 off-the-chart sales records showed how successful the redesign of the dream car had been. While there were a few cosmetic changes in '55 as well, the real change was in the availability of more power — "super power" available as an option that boosted horsepower up to 270. In those years there were advertising changes, as well. 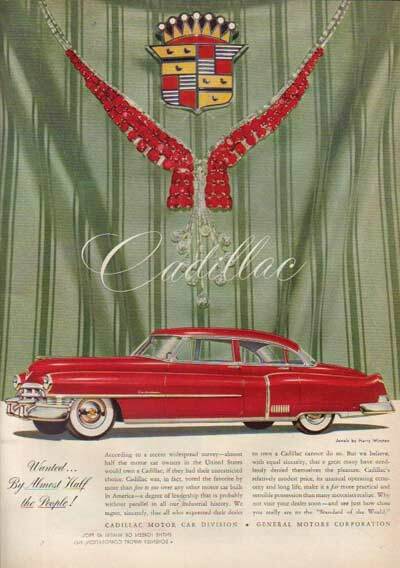 1954 ads featured photographs of models wearing designs made exclusively for the Cadillac campaign, in colors matching the Cadillac car also pictured. There were still jewels and furs to be sure but the real attention was to the color-matched set of dress (designed expressly for Cadillac by Jacques Fath, Hattie Carnegie, and others) and car. With these ads there was sometimes an overt pitch to women in the text, as well — "Never, to our knowledge, has a motor car so captured the hearts of American women motorists so quickly — or so completely." 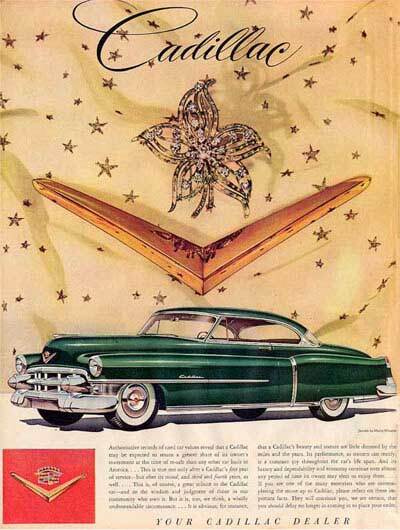 1954 Cadillac ads featured fashion designs created exclusively for the ad campaigns. By 1955, ads began highlighting social events — photographs with clear focus on the lead couple and fuzzy focus on the remainder of the scene. For these ads, a divided color bar topped the ad — black and red, black and blue, blue and red, etc. and showed off the Cadillac script. Attendees at these events always wore appropriate attire, i.e, cocktail dress at an outside garden party; evening dress, including long, white opera gloves, at the opera; and elegant evening wear at a diplomatic reception. And these events weren't all home-grown, either. One of these ads, for instance, featured a photograph by the renowned Cecil Beaton — of Christian Dior's Paris Salon fashion show. The slogans accompanying these ads noted that "the desire to own and drive the 'car of cars' is shared by people throughout the civilized world" and that the Cadillac "acts as a wonderful tonic for the spirit and outlook and disposition." Social events were highlighted in the 1955 Cadillac ads. That year there were also special-purpose ads. One entitled "For the Finest Days of Your Life" showed a bride and groom in their Cadillac. An illustrated Christmas ad depicted a couple beside a decorated Christmas tree, with the wife dangling gold keys from a green ribbon, the caption relating that this was a Christmas the couple would never forget. And an illustrated New Year's ad showed a man helping a woman with her fur. Beneath them was a yellow Cadillac sedan, and the caption read, "Happy Resolution for a Happy New Year". Whatever the event, a Cadillac helped make it a memorable one. In 1956, Cadillac brought out a new Hydra-Matic transmission, a 305-hp V8 engine, parking lights in the front bumper, and an aluminum grille with more small cells. It was also a year GM decided to go all out in its advertising, hiring fashion photographer Arik Nepo to capture their staged scenes of elegance. Nepo was born in Moscow but studied in France — at the National School of Photography and Cinematography. He began as a motion picture cameraman in France but British Vogue called him away in the thirties to do some fashion shoots. Thereafter he also did ad work for high-end products such as perfumes and jewels, shot a cover for Paris Vogue, etc. Settling in the U.S. in 1952, he continued with fashion shoots, becoming (as Camera magazine of August 1955 noted) worthy to be counted among notable fashion photographers such as Irving Penn and Richard Avedon. 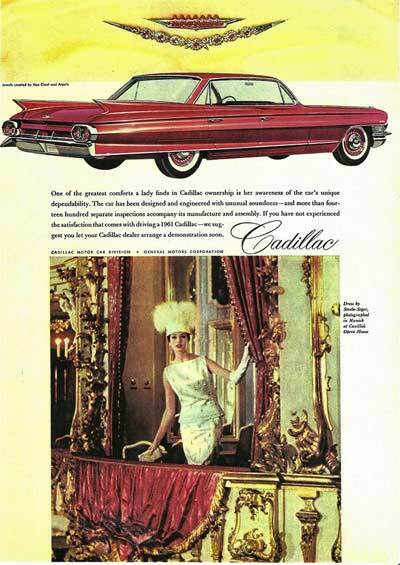 Typically, these ads had a white, V-shaped upper portion that showed the car, the Cadillac script, a highlight of the larger scene below, and ad copy. The lower portion of the ad showed staged scenes at various exclusive venues — the Boston Museum of Fine Arts, the San Francisco Symphony, dining at Romanoff's, an art opening at Boston's Museum of fine Arts, the Palm Springs Racquet Club, or luxury hotels and resorts such as the Plaza, the Hotel Mark Hopkins, and the Greenbrier. A whole range of designers created gowns for the Cadillac ads, their names synonymous with high-end fashion — Bergdorf Goodman, Pierre Balmain, Irene, Neiman Marcus, Dior, Lanvin-Castillo, Gallanos, de Givenchy, and others. Exclusive venues frequented by the wealthy were shown along with 1956 Cadillacs. There was a new body design in 1957, including a restyled front end with dual circular parking lights; rubber tips on the bumper guards; and hooded headlights. An X-frame made the car more rigid and the four-barrel V-8 engine had a new carburetor. The ad campaign with exceptional locales continued, this time with the Metropolitan Museum of Art, the Pan American Union, and restaurants and nightclubs such as the Pump Room at the Hotel Ambassador East and the Surf Club. There were still numerous hotel settings, too — the Beverly Hills Hotel, the Fairmont, and the Homestead. And new featured designers included Scaasi, Eleanora Garnett, Count Sarmi, Edith Small, and I. Magnin. The style of these ads, however, differed somewhat from the previous year in that there was no longer a highlight of the scene above. The Cadillac script appeared in gold as did the edge of the "V" shaped top portion. For whatever reason, 1957 also marked a return to the earlier jewel style ad. Refined, elegant necklaces by Harry Winston or Van Cleef and Arpels appeared against rich backgrounds — a mottled pink, a midnight blue sky, or a gold-toned folded fabric, each with starry highlights. In retrospect, the text for one such ad is a bit disturbing in that, emphasizing magnificence "beyond all expectations," it adds that Cadillacs owners are the right kind of people, "people you would enjoy knowing." Indeed, there is not an ethnic face in the crowd — so much for diversity in the fifties. Cadillac ads for 1957 emphasized that Cadillacs were for the right kind of people. The 1958 Cadillacs, billed as "the new American Classic", further accentuated the grille, now wider with straightened front bumpers and shallow, rounded prongs at the intersection of horizontal and vertical grille members. This was the first year for dual headlights, slightly changed trim, and less pronounced tailfins. Many ads noted that all windows were safety plate glass but, as in previous years, the real emphasis was on exotic luxury locales — holiday festivities at the Winged Foot Golf Club, an evening at The Breakers resort, or at The Desert Inn, the Del Monte Lodge, or the Bellevue Stratford. 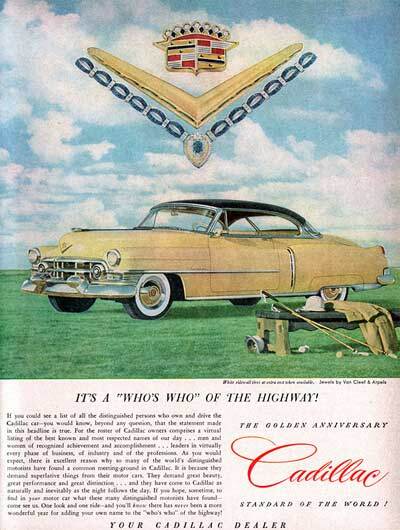 The style of these ads had changed a bit in that the top quarter showed the full profile on the car on a white background, with Cadillac script in gold and, below the car, the Cadillac crest and "V". The photographed social scene took up the remainder of the ad. There were also a few ads of individual models posed alongside a Cadillac. The models, showing off gowns by Marisa or Ceil Chapman, were posed in dramatic stances (e.g., confidently holding a long-stemmed red rose) against ethereal backgrounds, promoting "the great personal favorite of the American lady". Cadillac for 1958: the great personal favorite of the American lady. Extreme design by Peter Hodak took over the long, low, sleek 1959 Cadillacs with their pronounced tailfins, twin bullet tail lights, sparkling new radiator grille patterns, rear fender skirts, and Magic-Mirror acrylic lacquer finish. This car, perhaps more than any other, exemplified the ostentatious display of automotive design elements in the late fifties. In addition to its stylistic elements, it had a more powerful engine, and power windows, power seats, and cruise control were also made available to its owners. 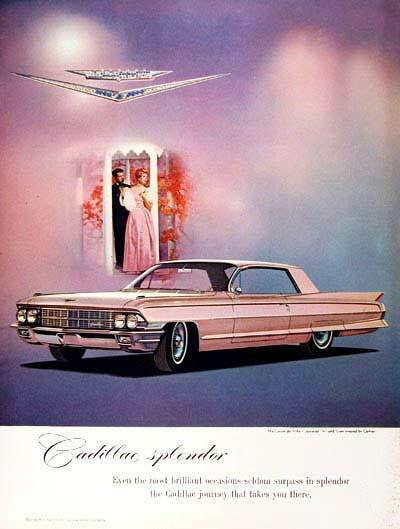 In ads announcing the season, this space-age looking Cadillac was called a "motoring majesty." 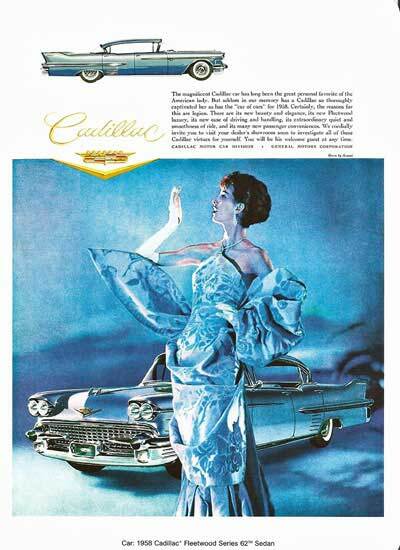 The social scene ads still held a prominent place in Cadillac's advertising, with gowns by Jane Derby, Countess Alexander, Elizabeth Arden, and others. Besides the usual stunning gowns, there were also some matching mother-daughter ensembles. These ads placed the social image on the the top two-thirds of the ad, with copy alongside it, that portion of the ad ending in a silver or gold "V". 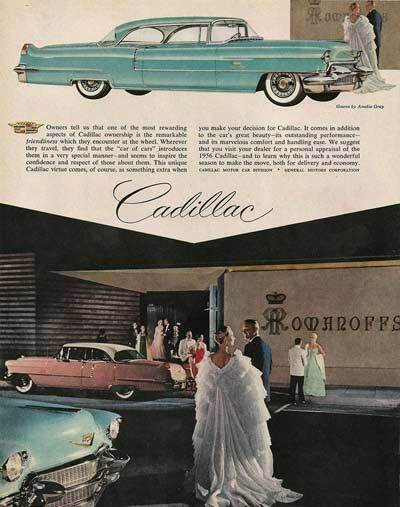 The Cadillac script and full photo of the car appeared in the lower third of the ad. The by-then familiar scenes include the United Nations Building, Perino's seafood restaurant in Los Angeles, and hotels including the Broadmoor, the Drake, and the Waldorf-Astoria. The impressive new car was called the "universal symbol of achievement", the "best synonym for quality". Cadillac for 1959: the universal symbolf of achievement. The Cadillac of 1960 was a little tamer — smoother with less dramatic tail fins. The front grille was no longer separated by a horizontal bar and there was less chrome trim overall. The car was available in twenty exterior colors — from ebony black to champagne — most iridescent. The number of colors in the ads surely rivaled those available for the car. The car color matched the jewels — a Pompeian red with rubies, Inverness green with emeralds, an Arroyo turquoise with aquamarine, and a Pelham blue with sapphires. Of course, diamonds and gold went with any color at all. The overhanging striped canopies, which also ended in a V-shape, echoed the car color, as well. Familiar jewelry names appeared in these ads — Harry Winston; Van Cleef and Arpels; and Black, Starr & Gorham. The same was true of designers but these designs were over the top. There was a pink floral print for mother and daughter, both with short pouf sleeves, by Alessandra De Paolis of Ines Da Roma and another mother-daughter ensemble by Scaasi that included enormous white bows on navy blue dresses, with conical white hats topped by artificial navy blue pompom flowers. 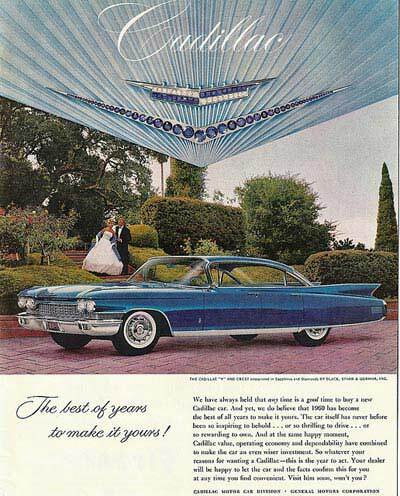 The Cadillac for 1960 was a little less dramatic than the previous year, but not their advertising. While these ads ran in national magazines, their formal image could not overcome the latent racism in copy such as this, emphasizing "quality over equality". "As a jet aircraft is to a rickshaw, as the Parthenon is to an African hut, as the white man is to the bushman, so is the Cadillac to other motor cars." The 1961 Cadillacs were restyled with sculpted side panels and a spiffy new grille that receded from its center point, top to bottom and side to side, between dual headlights. The cars were also roomier with improved suspension. Front roof panels slanted forward, and there were no longer wraparound windshields. 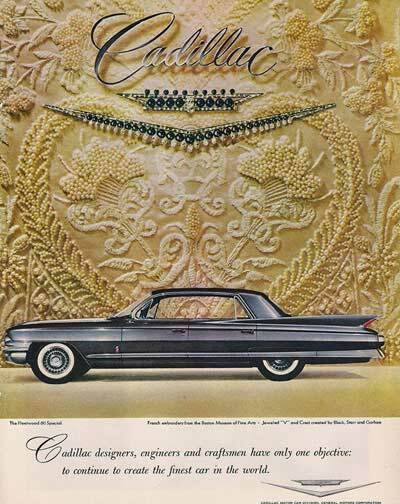 Returning to the earlier jewel series of ads, Cadillac went to draped backgrounds of lavish museum textiles. There was golden thread detail from a matador's cape and French embroidery on velvet from the Brooklyn Museum, a 17th century brocade from the Detroit Institute of Arts, Turkish embroidery and French embroidery with silk threads and seed pearls from the Boston Museum of Fine Arts, etc. The usual stable of jewelers continued to produce even more elaborate jeweled pieces to accent the ads. And the ad copy pronounced Cadillac's supremacy: "Wherever highways lead and quality is recognized, Cadillac is known and accepted as motordom's supreme achievement." Despite that supremacy, in these ads the cars themselves were clearly overshadowed by the sumptuous textiles. The textiles displayed in the 1961 ads overshadowed the car. That year there was also a series of opera ads featuring elegant jewels, a Cadillac, and photographs of sumptuously gowned women at Milan's La Scala Opera House (gown by Simonetta), the Vienna Opera House (gown by W.F. Admuller), the San Francisco Opera (gown by Norman Morell), and Munich's Cuvillies Opera House (gown by Staebe-Seger). The ads reminded ladies that they could select a car to match their personalities — and that they could delight in the car's roominess. Why, even getting in and out of the car would be "the most graceful of actions". One a series of opera ads for the 1961 Cadillac. In 1962, the Cadillac's tailfins were a little less pronounced and lacked chrome trim; the grille was flatter and its center horizontal divide a bit thicker; and a new roof line that resembled a convertible with its top up. Ads that year featured the now-familiar jeweled crest and "V" at the top right-hand or left-hand corner, below which was a diminutive scene of a couple in an opulent setting. Then the Cadillac itself appeared, front and center. Valuative nouns appear to have been "in" that year, ads proclaiming Cadillac's value, individuality, superiority, silence, acclaim, supremacy, leadership, worth, splendor, elegance, magnificence, etc. After 1962, while Cadillac ads continued their focus on the finer things, those things appeared more attainable in that the settings were generic. There were no longer couturier fashions, jewels for the mega-wealthy, or exclusive resorts. American popular culture was becoming more complex — with escalating troubles in Vietnam, a continuing campaign for civil rights, the Beatles dominating the music scene, beehive hairdos, et al. While, in the popular imagination, Cadillac continued as the leader in luxury automobiles, the myth that owning one could lead to wealth beyond measure was too simplistic to be believed.